This is a project that just happened. It was not planned at all. Do you ever have that ? ☻It happens when I go through my stash of supplies that I really want to use up to make something useful. I loved the end result, so I had to share a tutorial. First I made the above -imperfect-because-I-am-in-a-hurry- small baby blankie for my son to play with. (I'm sure you have seen these tag blankets before.) I noticed he loves pulling on little things, and so I thought he would like this. He loved it! My squares were about 5 1/2 inches square. If you want to add an extra layer of softness, pin this to some warm and natural. 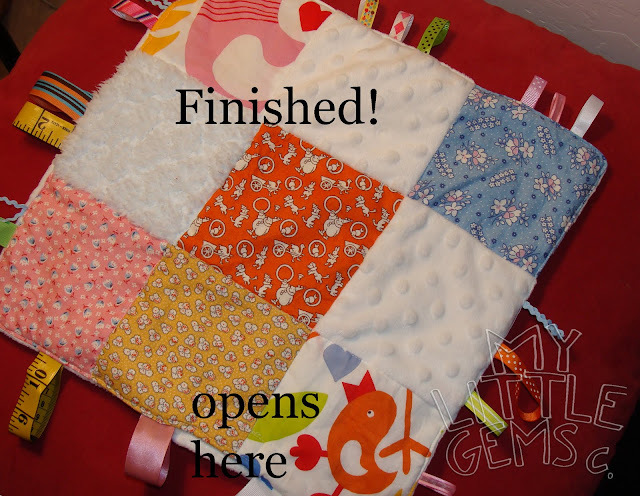 Stitch on top of your squares(the side that will show when you are done) right along where your squares are sewn together. 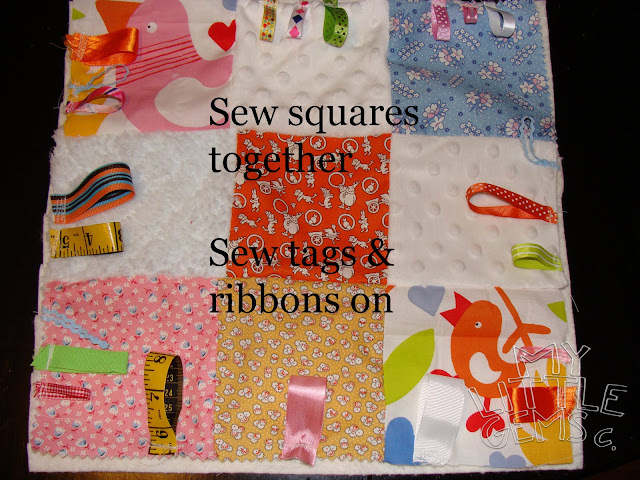 Sew on your ribbons and tags so they are facing into the blanket squares. When you turn the blanket, they will face out off the edge. Remember to leave a spot with no tags so you can put your velcro in and turn it right side out. NEXT pin your backing to this side so that right sides are together. 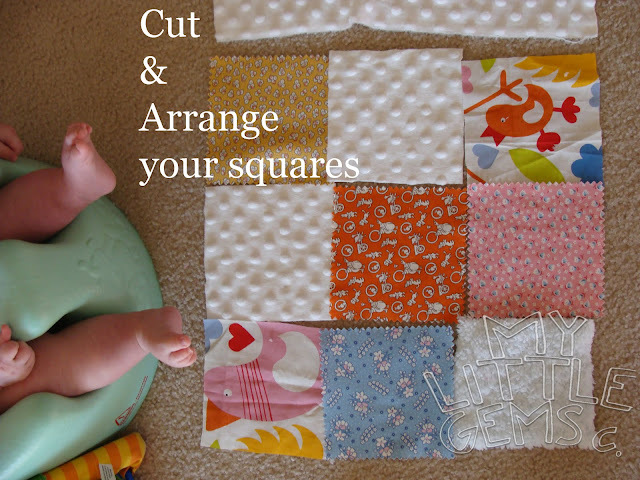 Sew all the way around the square at 1/4 inch. 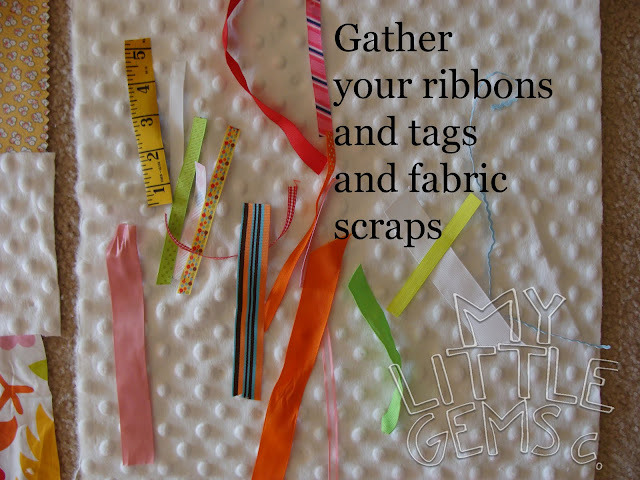 Double check to make sure you caught all the tags and ribbons inside the seams. Trim your seams, turn it right side out through the opening you left unsewn. 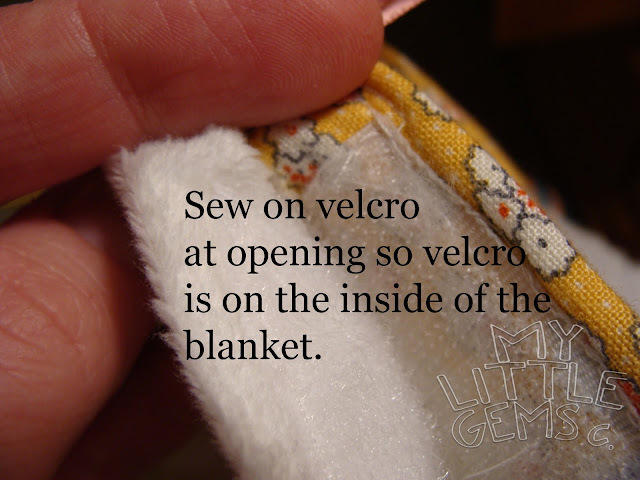 Where the opening is, fold the seams into the inside, and sew on your piece of velcro. 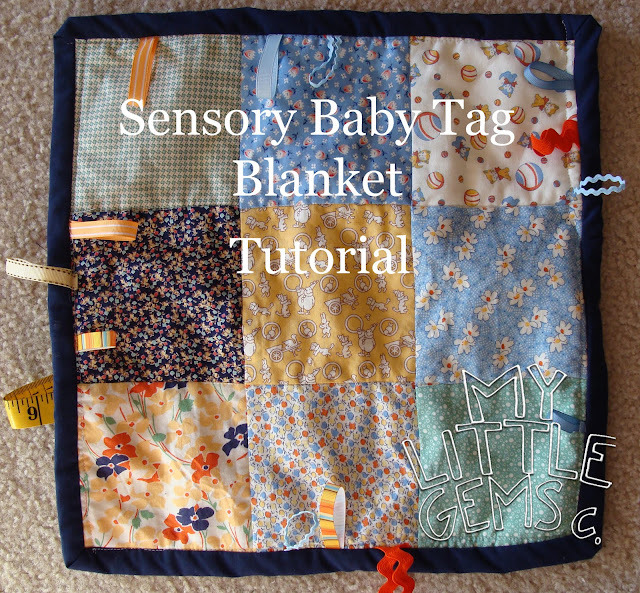 This way, you can open the blanket and insert a plastic grocery bag, empty baby wipes bag (like from Costco's wipes), something noisy,that you normally would not give an infant to play with. (DON'T put small things inside like beans, or something...because it could get out if the velcro was opened.) The opening/velcro closure provides a way to wash it, and make it a quiet toy too- or noisy-depending on if you put something inside or not. You can just sew it closed too and not do this part at all. AND he really does love it. He loves to pull and feel the tags and ribbons, hear a crunchy noise when something is inside, and feel the soft fabrics. He loves to look at different prints too. 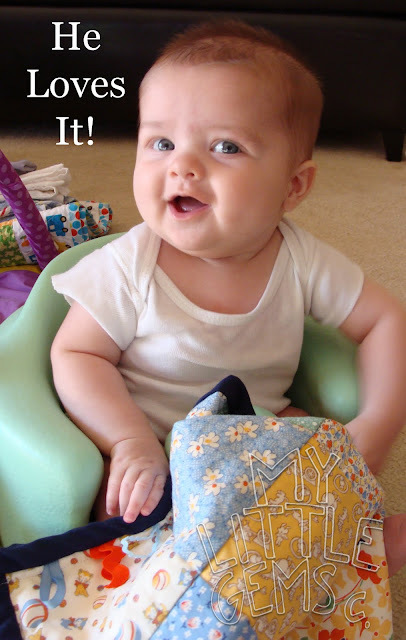 So you see- it uses many of the baby's senses! This is a great tutorial! Thanks for the tip on making an opening to put in the 'crunchy' stuff so you can remove it for washing! Great idea! What a prefect blanket for your little man. He is going to get so much enjoyment out of this. What a lucky boy to have such a clever and crafty mummy. I got one at a shower for my first son and all my sisters and in-laws had to have one, too! I definitely like it better with the ribbons out, though. It makes them easy to grab. My guys have loved them! 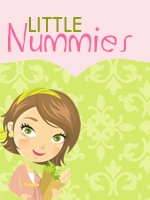 I love these little blankies, the babies love them also. Your little guy look great! He seems to be doing very well. Hugs and Love to all. Blanket looks great! Did you know you can also sew in the lining from a cereal box and it will ake the blanket crinkle. 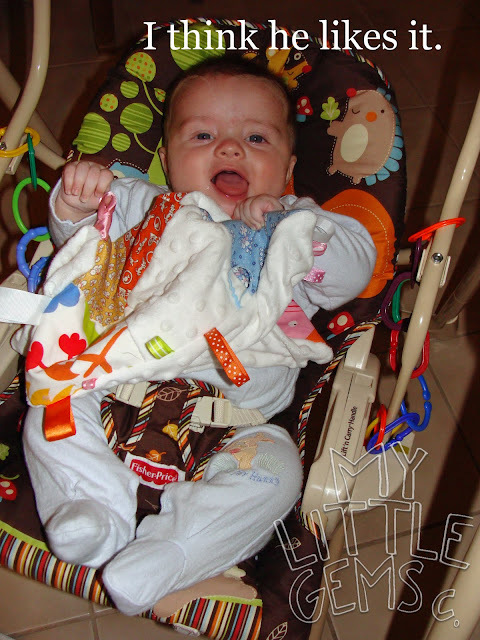 Babies love that crinkle sound.